will make their UK public debut at the PROFIBUS UK Conference in June. Part of the WAGO-I/O-SYSTEM 750 the new 750-375 and 750-377 PROFINET IO Fieldbus Couplers support the latest PROFINET Standard V2.3. Both models are equipped with an integrated 2-port switch, enabling line topology without extra components. Additionally, both couplers support LLDP protocol, allowing for device replacement without programming. Besides standard PROFINET features, such as topology detection and comprehensive diagnostics, both fieldbus couplers provide additional functions. Key features include: PROFIenergy profile for efficient energy management, Ipar server functionality and Tool Calling Interface (TCI). Standard communication via PROFIsafe protocol (Safety Integrated) allows both 750-375 and 750-377 couplers to be used in safety-related applications. The 750-375 PROFINET IO advanced Fieldbus Coupler, which carries its own supply module, creates local process images for maximum two I/O controllers and one I/O supervisor. The coupler features an integrated Web server (e.g., for advanced diagnostic capabilities) and supports “Shared Device,” allowing connected I/O modules to be divided into functional units. It also permits easy separation between standard and safety functions within in a node. The 750-377 PROFINET IO advanced ECO Fieldbus Coupler, which is not equipped with a supply module, creates local process images for both I/O controller and supervisor. 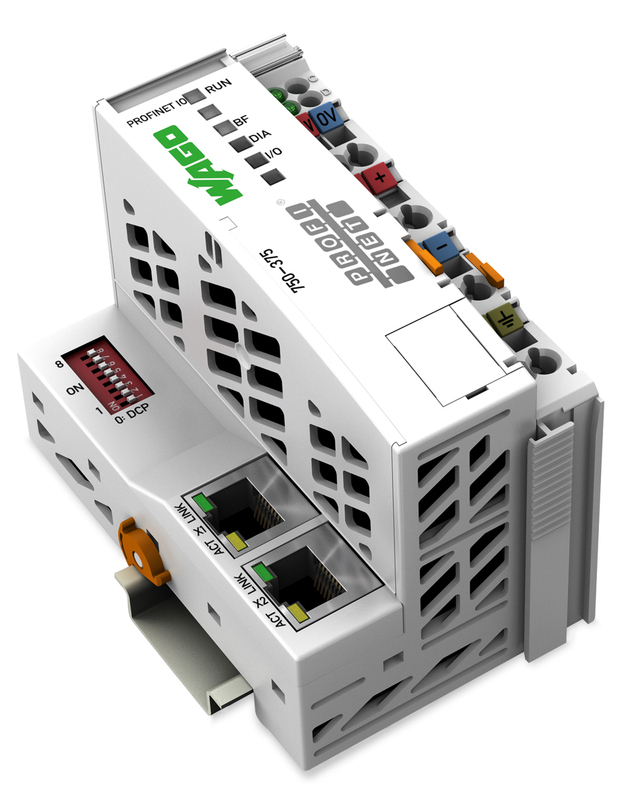 The fieldbus-independent WAGO-I/O-SYSTEM 750 is approved for a wide variety of applications. Featuring finely modular components, the WAGO-I/O-SYSTEM meets all the requirements for distributed fieldbus systems. The system’s modularity is also reflected in its support of numerous fieldbus systems. Depending on the application, it is possible to choose between fieldbus couplers and controllers (PLC) for different protocols. With 400+ digital, analog and specialty I/O modules, the WAGO-I/O-SYSTEM 750 offers scalable performance and high integration density with an unbeatable price/performance ratio.